I will be giving away free custom sign stencils this week because I recently discovered that I can generate huge stencils with letter sizes from 3 inches to 24 inches high using the CMC equipment I use to cut mats for pictures. I made up some 24" by 36" sign stencils and they are easily read from 250 feet away. I can make these stencils up overnight or while someone waits if they want to drive out to my workshop. Otherwise, I will deliver to downtown Floyd when I pick up and deliver custom framing orders. I think these are a potential boon to anyone who is running a yard sale, a high school car wash, an open house, anything where sign visibility is important. These stencils are durable and reusable and should make many stenciled signs using spray paints or paint rollers. I want to find how much need there is for this product in this area. Here is my offer – Pass it on to your friends in this area. I will make a free custom sign stencil for anyone who wants one for the rest of this week. 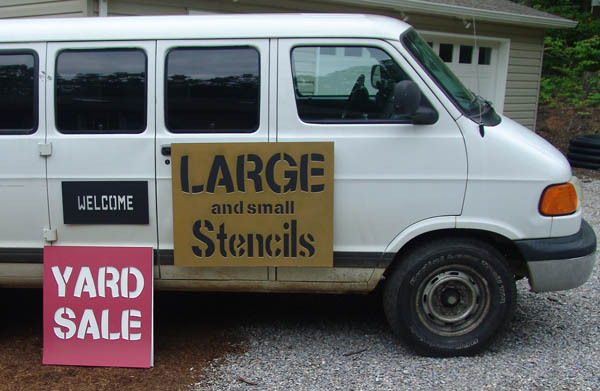 This offer ends on May 31,2008 or until I have made 25 free sign stencils, whatever comes first. Stencils can be picked up at Floyd Custom Framing or may be picked up in downtown Floyd by prior arrangement. How large are these stencils? See for yourself. What could you do with stencils like these? This entry was posted in Basic Business Concepts, Micro-Business, Possibly Helpful Advice and tagged Floyd Custom Framing, free stencils, test marketing. Bookmark the permalink.